In taking these points into consideration, producers may add fatty acids to their ewe rations to benefit from the increase in lamb weight gain. However, in going one step further, what would be the benefit of supplementing lambs with fatty acids once the lambs are on the ground? Does the type of PUFA matter? Do PUFA’s affect overall carcass quality? In order to address these question, Radunz et al. (2009) investigated the effects of PUFA (soybean and linseed oils) supplementation in pre and post weaning diets on the growth, performance, and carcass quality attributes of growing and finishing lambs. In this experiment, Radunz et al. (2009) used 4 treatments to conduct this experiment: 1) control diet pre and post weaning, 2) control diet preweaning and oil supplementation post weaning, 3) oil supplementation preweaning and control diet post weaning, and 4) oil supplementation pre and post weaning. 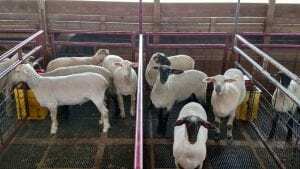 Lambs were harvested at approximately 130 lbs. to evaluate the growth, performance, and concentration of fatty acids found in the muscle and adipose (fat) tissues of the carcasses. In general, lamb growth and performance (dry matter intake, average daily gain, and feed efficiency) were not affected by oil supplementation. In addition, carcass measurements (hot carcass weight, back fat thickness, and kidney fat) were also not affected by oil supplementation. However, from the standpoint of carcass quality, lambs supplemented with oil in the post weaning diet had an overall darker color of loin chops when compared to all other treatments. All other carcass measurements were not affected by oil supplementation. In addition, oil supplemented lambs demonstrated a slight increase in PUFA’s in the muscle and adipose tissue. It should be noted that the inclusion of oil supplementation, regardless of treatment, did not affect cooking moisture loss or tenderness of muscle tissue. 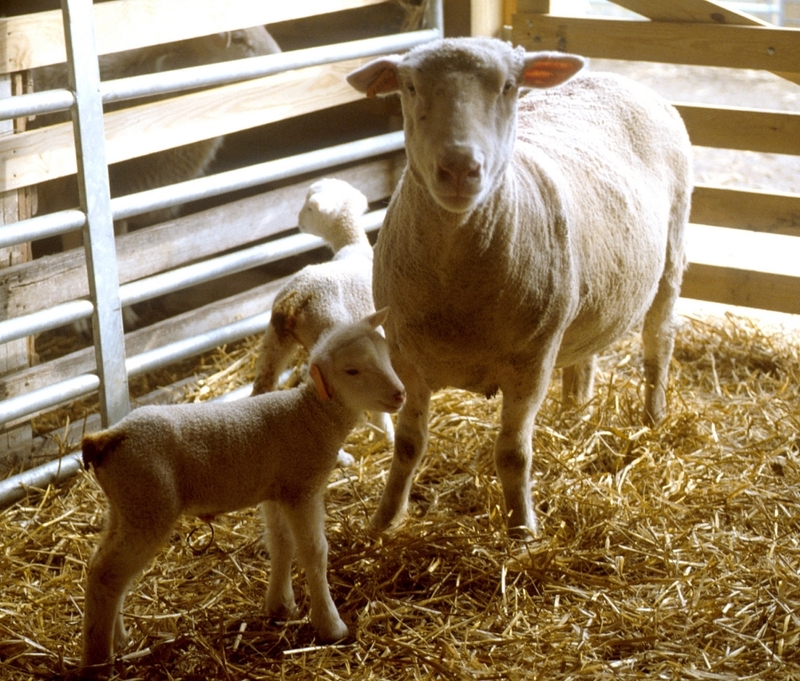 Overall, oil supplementation showed no affect on the growth and performance of growing and finishing lambs. For producers feeding and selling lambs on the open market, feeding diets supplemented with soybean and linseed oils may not be beneficial. However, for those producers harvesting their own lambs and selling their meat products at the retail market may find some benefit. For example, clientele may desire a meat product with a darker color. In addition, considering the affects of an increase in PUFA’s in the meat products is important. In this experiment, a PUFA of interest was conjugated linoleic acid (CLA). Conjugated linoleic acid has shown to have positive health benefits, but according to Radunz et al. (2009), CLA was minimally increased in adipose tissue, but not in the muscle tissue. Therefore, the intended health benefits may be up for further discussion. 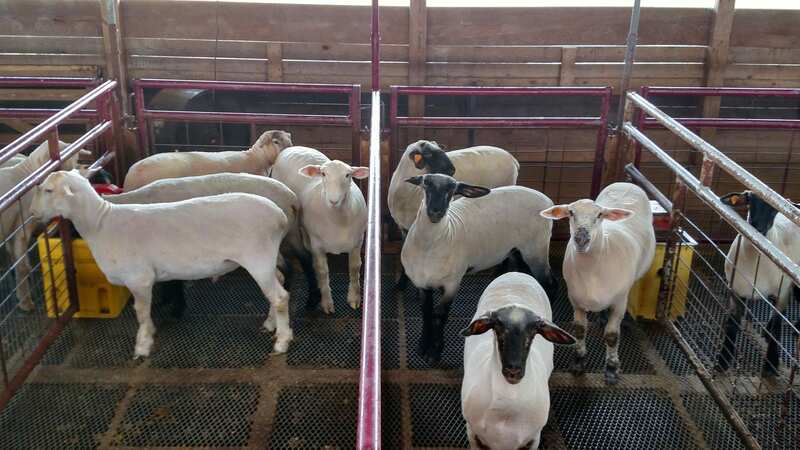 Therefore, prior to implementing this type of feeding strategy, producers must first seek a market for their lambs and if they choose to sell a retail product, then the appropriate clientele must be found and willing to pay. Radunz, A. E., L. A. Wickersham, S. C. Loerch, F. L. Fluharty, C. K. Reynolds, and H. N. Zerby. 2009. Effects of dietary polyunsaturated fatty acid supplementation on fatty acid composition in muscle and subcutaneous adipose tissue of lambs. J. Anim. Sci. 87: 4082-4091. Posted by Braden Campbell at 8:00am January 30, 2019 Posted in Nutrition, Research and tagged Management, Nutrition, Research. Bookmark the permalink.